The joint opposition said today people should stop paying taxes to the government, if it continues with its move to pay compensation to ex-LTTE combatants. 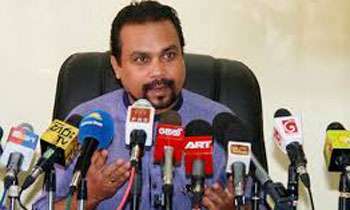 JO member and MP Wimal Weerawansa told a news conference that no country in the world had ever paid compensation to ex-terrorists unlike what Sri Lanka was attempting to do and added that such moves would not contribute towards reconciliation. He said the government was hoping to pay compensation to ex-LTTE combatants by using tax payers money saying Sri Lanka will be the first in the world to pay compensation to terrorists. The people should stop paying taxes as that goes to maintain you MPs in Parliament and enjoy untold perks. I TOTLLY AGRE WITH WIMAL. CAN ASK WIMAL TO TELL HIS BOSS TO RETURN THE TSUNAMI FUNDS BACK TO PUBLIC. THEN WE CAN ASK THE PUBLIC NOT TO PAY TAXES. ALSO WIMAL SHOULD PAY ALL THE COMMISSION HE MADE WHEN HIS BOSS WAS IN POWER. Did you pay any tax? But those poor agents get arrested and charged but not the high and mighty Wimal and Shasha. Wimal Weerawansa, better fast this time also under the Pettah bow tree. There are lot of LTTEers joints Civil Defence Force. 12000 LTTE rs were pardon given by your Government, but there is not wrong if Government take any decision to help them to enhance their normal life. I agree that it is unfair to use taxpayer money to pay compensation to those who tried to destroy the country and the economy. At the same time ex-combatants should be given an opportunity to compensate the country by re-integrating and leading useful lives. M/s Robert and Ranjit: On this issue, what Wimal says is gospel truth. Please keep your tribal politics to a side and stand on your feet instead standing on your head. It is enough your trips to "Kade". Time has come to analyze things logically. So is it justified to pay tax payers money to terrorists? Use UN money instead then. Whats wrong in giving someone a new start in there life? Hon. Wimal. why we have pay taxes to enhance the life of corrupted politician like you for doing nothing to the country. Every Srilankan with sufficent income must pay taxes to central government. Conflict is issue no one likes but created by all of us ending in troublesome episodes of murder abductions killing murder of innocent citizens. As citizens of the country irrespective who we are all those suffered must receive sufficent compensation to start living. Bombing destroying properties of citizens of north and east must be compensated as a matter of responsibility. Here comes the future Minister of Finance under Rajapakses. God help Sri Lanka! My Dear Wimal, If the terrorist Minister in the former regime can squnder the funds of the public after murdering innocent civilians and security forces there is no harm in rehalitating the former LTTE carders. You yourself was up to terrrorism when you were in the JVP. In 1989 JVP has destroyed Govt. properties and stopped payment of taxes. You are the one of the main leaders of JVP at that time. Are suggested to become the same things now. Have you ever paid any taxes? have you ever tried to find out as to what happened to container loads of Currency and gold captured from LTTE? We even paid out of our own pocket for extra passports!! How much does Immigration department spend to print a passport? The purpose of tax is to maintain public assets and develop resources for public good to improve overall quality of life. If people don't actually gain from these taxes (and only the same 10% benefit from it every year) in return, then we should all stop paying. What are they going to do? Jail the entire work force? Without party politics we need to hold all politicians and government departments to accountability. A democracy is about strength in numbers pushing for a moral and equal society.